June 21st is World Music Day, also known as Fête de la Musique in France, where it all started. The World Music celebration is a great opportunity to educate and expose the public to different genres of music. A world music festival ‘day observance’ is a great time to give musicians a chance to share their kind of music- whether it’s a folk music tradition or an innovative personal style. This week I bring you a whole variety of music genres. I do this by means of a Putumayo world collection vis-à-vis an artwork that is representative of the featured music genre. The Fête de la Musique, also known as , is a music festival taking place on June 21. The idea was first broached in 1976 by American musician Joel Cohen, then employed by the national French radio station France Musique. Cohen proposed an all-night music celebration at the moment of the summer solstice. The idea was taken up by French Music and Dance director Maurice Fleuret for Minister of Culture Jack Lang in 1981 and first took place in 1982 in Paris. Its purpose is to promote music in two ways: Amateur and professional musicians are encouraged to perform in the streets. The slogan Faites de la musique (Make music), a homophone of Fête de la Musique, is used to promote this goal. Many free concerts are organized, making all genres of music accessible to the public. Two of the conditions to being approved by the official Fête de la Musique organization in Paris are that all concerts must be free to the public, and all performers donate their time for free. French Café is a collection of classic and modern French music that will transport the listener to the romantic streets of Paris. The album features some of the greatest names in the history of French music as well as new artists who are inspired by classic chanson, gypsy jazz and musette. 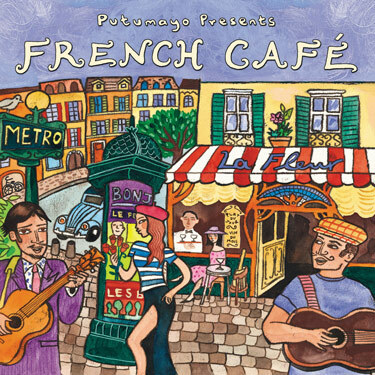 I have chosen to bring you Putumayo’s French Café CD alongside Picasso’s Three Musicians because they come from a distinct time in the history of France wherein the café was a place where great minds congregated. 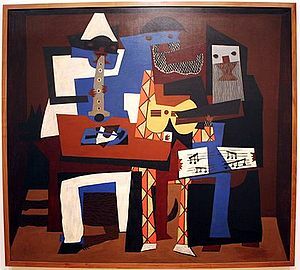 And these 3 friends: painter Pablo, poet Guillaume and artist/writer Jacob are represented in this painting, making music together. Each musician is a different character, representing each one’s unique personality and life pursuit, and the music they played represents the beautiful friendship they shared that for sure enriched and inspired each other’s life and works. 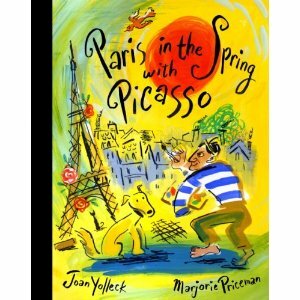 Joan Yolleck takes the reader on a trip through the streets of early 20th century Paris to look in upon their friends writer Guillaume Apollinaire and his girlfriend painter Marie Laurencin, writer and painter Max Jacob, and artist Pablo Picasso and his girlfriend model Fernande Olivier. 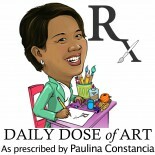 This entry was posted on June 17, 2012 by Paulina Constancia in Uncategorized.